What's in the pink boxes? Wings . . . wands . . . tutus . . . tiaras . . . all the makings of magic. What age is best for a party? 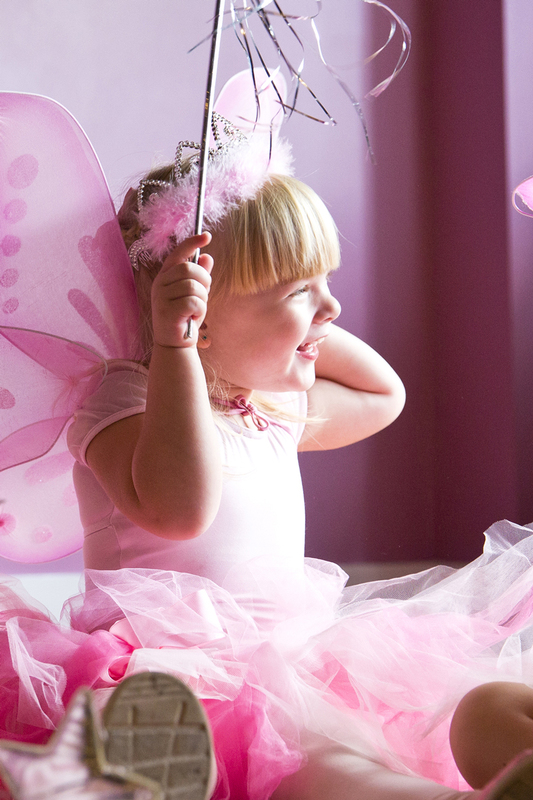 Ballerina Girl parties are perfect for ages 3-6. Where can I host a party? Ballerina Girl parties can take place right in your home or in a venue of your arrangement such as a clubhouse or community center. How many girls can I invite? The most idyllic Ballerina Girl parties are smaller groups of 5-8 girls. However, up to 10 girls can be accommodated without incurring additional charges. Can boys come to a party? Ballerina Girl parties are best for a year when you are planning an all-girl birthday party. Ballerina Girl is subject to availability and parties can be booked up to one calendar year in advance. It is highly recommended that you book as early as possible in order to secure your preferred party date. When does the dancing happen? The dancing happens at the beginning of a Ballerina Girl Party. Guests are encouraged to arrive on time. Ballerina Girl parties are an hour and a half long. Guests can dress in dance attire if readily available or simply in stretchy clothes. Is any previous dance training necessary? No previous dance training is necessary to participate in a Ballerina Girl party.